Artist Sam Lewitt’s new exhibition, Less Light Warm Words at the Swiss Institute, is literally New York’s hottest show this summer. Lewitt manipulates not just what the viewer sees, but what the viewer feels—on a very physical level. 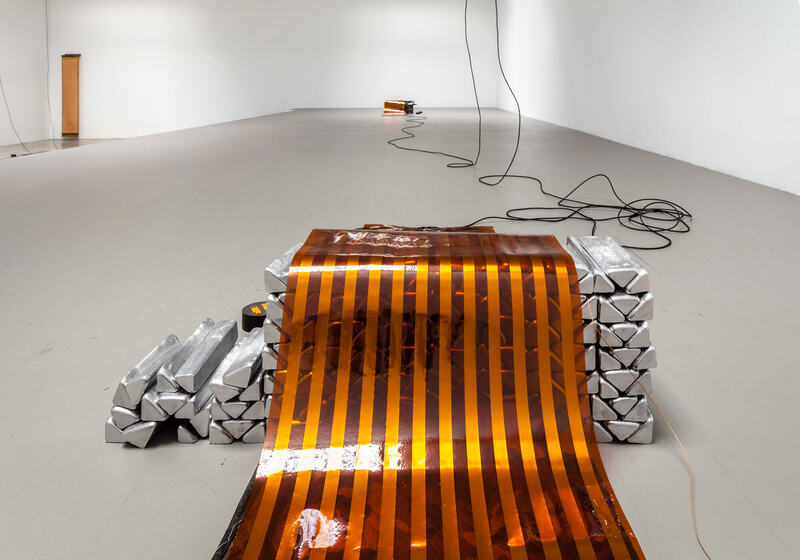 Comprised of flat copper heaters along the floor of the gallery, which attempt to maintain a temperature of 140 degrees, the show emits a warmth that got the crowd hot and bothered at the opening in June. Advance warning: prepare to sweat if you visit the show. Eight of the heaters lie along the floor. Slightly larger and thinner than yoga mats, etched with intricate wording (like a hieroglyph, said Coplan), their function becomes quickly apparent. Before you are able to decipher the meaning of the designs (the etchings correspond to different phrases from the heaters’ marketing and instructional language—“flexible control,” “internal stability,” “freeze protection,” etc. ), you can feel the heat they radiate. On the platform above the floor sit two more heaters with additional elements. One lies atop aluminum ingots that Lewitt created by melting down a car engine. He placed a heating blanket beneath the structure. An engine sits beneath the other. Temperature readers attach to both of these as well. Black cords connect all the heaters to the ceiling. Lewitt took out the Swiss Institute’s fluorescent lights and rewired the electricity to flow into the heaters instead. Next to the heaters sit black circular readers that display the actual temperatures around them. The number fluctuates as the viewer walks closer, contributing his or her body heat. The work is somewhat site-specific. The ceiling height dictates the lengths of the cords and the room dimensions determine the space between different heaters. Yet, Lewitt can also install it anywhere, as long as there’s an energy source. He’s shown the work at the Wattis Institute for Contemporary Arts in San Francisco, Kunsthalle Basel, and an Airbnb in New York City. In each of these locations, says Coplan, Lewitt is “making visible the systems.” While he brings our attention to what we generally can’t see, he makes his wording on the heaters inscrutable. Language, which we can generally glimpse and immediately understand, becomes hidden while energy flows, temperatures, and our impacts on our environment become immediately intelligible. He also exposes the machinery (heaters, engines) that typically remains unseen. Lewitt asks us to question the mechanisms, both physical and figurative, with which we interact daily, how we impact them and how they affect us. Something to consider while you scorch.